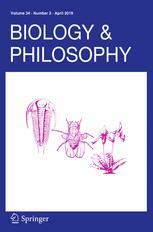 Biology & Philosophy aims to publish the best original work in philosophy of biology, broadly understood to span conceptual, theoretical, and methodological issues in the biological sciences. It is aimed at a broad readership across the sciences and humanities, and welcomes submissions from authors in these disciplines. Most of the articles we publish are standard research articles of 10,000 words or fewer. Occasionally, Biology & Philosophy will publish target articles (along with commentaries), review essays, and area reviews. We will also consider publishing special issues. If you are interested in contributing any format beyond a standard research article, please contact the Editor-in-Chief.